Being a cross between a Harlequin Macaw (hybrid) and a Shamrock Macaw (hybrid) gives this interesting macaw a lot of varying influences, both in color and in personality. It is influenced by the genes of four different species of macaws. As you can see in the picture above, this hybrid has a unique coloration. Hybrids have been traditionally bred for color. So being able to attribute personality traits to a hybrid are factors that are quite unknown. However with having four different grandparents this bird has a chance to be a pretty fair talker, thanks to the Blue and Gold Macaw. It may also have a very nice temperment thanks to the sweet, gentle nature of the Green-winged Macaw. The amiable personalities of both the Blue and Gold Macaw and the Military Macaw may also shine through. However, if the temperment of the Scarlet Macaw is present it may also be a handful, needing firm and consistent training. Currently there is no known and accepted common name given to the Harlequin x Shamrock Macaw. The common names given to hybrid macaws are often derived from physical descriptions like color or patterning, or sometimes they are coined from the name of a person or location where they originate. A name is used by one person and then used by others, and eventually becomes recognized as the accepted common name. Some great suggestions for the common name of this hybrid include the Christmas Macaw, Copper Fire Macaw, Hardrock Macaw, Casio Macaw, and Sharlequin Macaw. Scientific Name: The Harlequin x Shamrock Macaw is a second generation hybrid developed from parents that were first generation hybrid macaws. It is a cross between a Harlequin Macaw hybrid and a Shamrock Macaw hybrid. Description: Hybrid macaws have been primarily bred for color. One of the challenges with the cross breeding of hybrids has been with the coloring having a tendency to get muddied. This has been found on some third generation and deeper crosses (even on some second generations). Both parents of the Harlequin X Shamrock Macaw contribute to the striking colors of their offspring. Because the father's have the dominant gene, this will influence their final appearance. 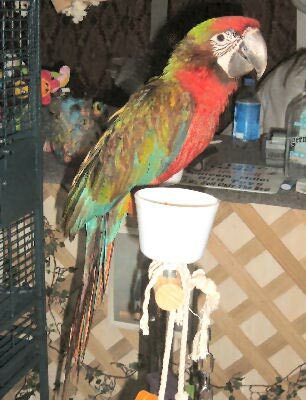 The father of this macaw is the Harlequin Macaw. The green back with a bronze cast to it is attributed to the Harlequin Macaw. Though the coloring is not "muddied" per se, the bronze on this macaw is becoming even more prominent than on his parent, and it has a bronze collar. There is also a strong red coloring, possibly from a Scarlet grandfather. Social Behaviors: The Harlequin X Shamrock Macaw may take on the natural docile side of the Green-winged with some of the natural clownish personality of the Harlequin Macaw (the word harlequin is defined as 'clown'). But it may also have the more dominant temperment of the Scarlet Macaw. Availability: These birds are occasionally available and are expensive. There are more and more macaw breeders however, so finding these macaws for sale becomes easier as they become more common. I've saw this hybrid before and they called it a Christmas macaw. My aunt has one of these. She was given a Shamrock and a Harlequin, both suposedly females. The Shamrock turned out to be a male and they raised 1 chick. She talked to the bird's breeder and the breeder told her the Shamrock/Harlequin cross was called a Christmas Macaw, "because they are mostly reds and greens." However, I don't know how acurate that is. Congrats Donna!! !I'm happy that there will be another Heidi book to look forarwd too!!! (Did you decide on a baby name? )I'm happy to say that B'girl had her final Level 5 gym meet yesterday and did very well. I think though, she was more excited that it was her last one, which means no more of the same floor music for 4 hours. She told me afterwards that she can't wait until next year and she thinks she's going to do really well. I'm so glad her excitement is back (she struggled a little last time this year with fear issues). I'm happy that I get to pull out the shorts!!! I've been wearing flip flops for awhile, but they are so much better when they are paired up with shorts!!! Oh and we got a new baby this week! We welcomed Fionna (aka Little Bit) into the family. She is a talker and loves to play with our other ratties tails. They are very good to her and have even let her push them out of their bed. I bet it was the quad macaw. you already had a gray? If you rllaey don't have big bird experience you should get it before you get a rllaey big bird. Starting your big bird experience with a H Macaw would be like someone handing you the keys to a Vette. Beautiful Birds. They get very close to their owners. They are one person birds. My best friend's mother had one and no one could get near it but her! They talked and carried on. How cool!